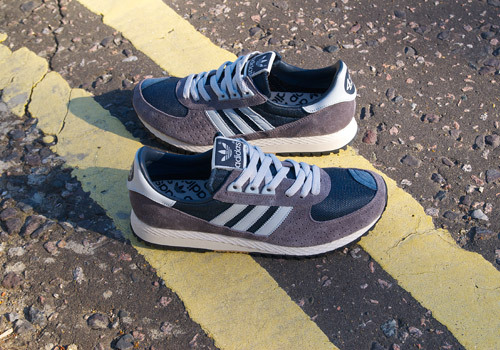 Following the various runner retros of late 2012 and early 2013 – such as the Centaur (now called the CNTR), Tech Super, and Torsion Allegra – it’s no wonder that adidas revives the City Marathon PT to join them. 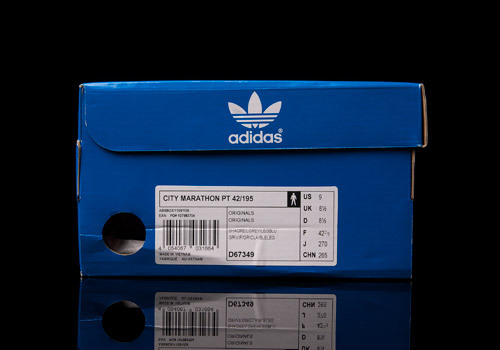 In fact, if one recalls, the Marathon (in a stunning gold and red colorway) reappeared at select retailers in July of 2013, hinting at, but not quite representing the OG model. 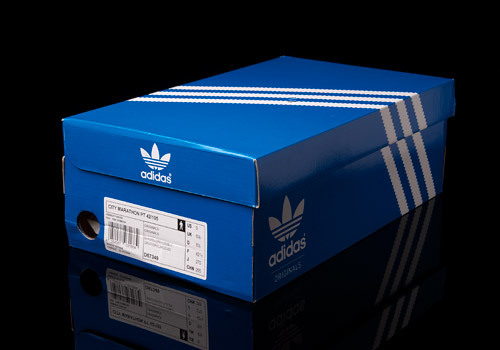 As a distant cousin (or upgrade, if you will) it’s the PT’s turn to shock and awe, with this fantastic pack based on one of adidas’ favorite themes: American cities. 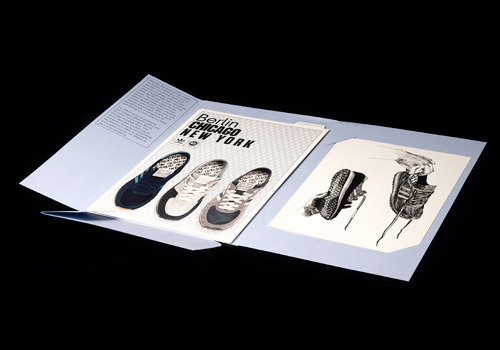 A promotional version of the pack was released to media partners including a special publication package complete with some rather comforting illustration by Daniel David Freeman and a series of intricately designed info-cards that elaborate on the City Marathon PT Pack. 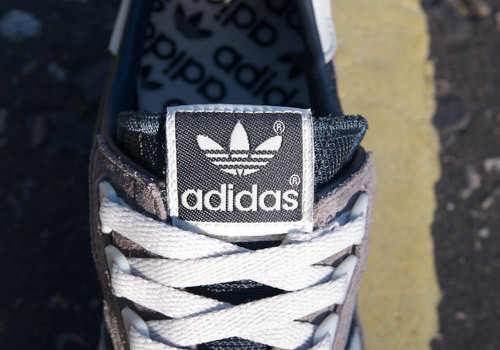 The first of which includes a substantially swelling interview with Simon ‘Woody’ Woods (the founder of Sneaker Freaker magazine) in which he explains his love of the late ’80s to mid ’90s era runners, describing what he thinks goes into a perfect running shoe, telling his past experiences growing up spun on trainers, and generally expressing his love of adidas Originals. 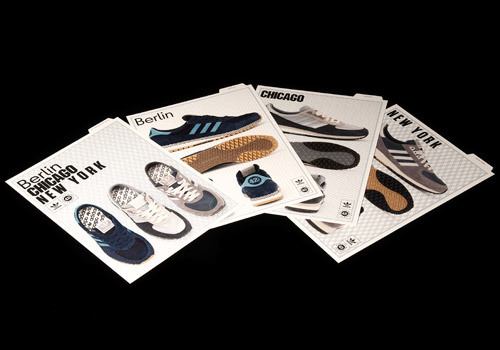 The following three info-cards are each dedicated to one of the releases from the pack, the Berlin, Chicago, and (pictured here) New York pairs. 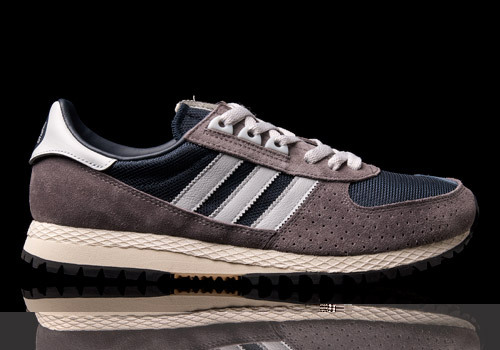 Obviously representing the fast-paced, no frills, all-about-business American city, adidas Originals explains that they’ve chosen the sharp and light grey mixture to describe the “industrial hue of the iconic Verrazano-Narrows Bridge, which links Staten Island to Brooklyn.” Each of the other shoes (and cities) have their own meanings as well, and the pack presents itself proudly, but with a humble nature. Which is surprising, actually, as the story behind the release is a grand tale of resurrection. 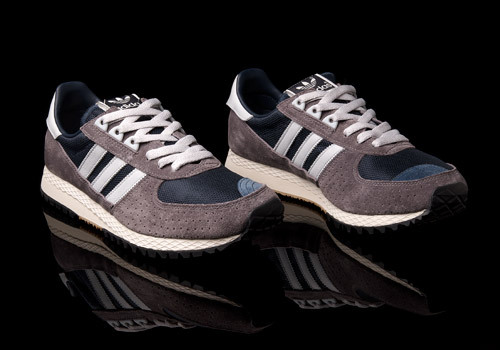 At a nodding ninety years of age, one of the former Technical Directors of adidas happened to discover a pair of OG City Marathon PTs in his attic during a move. 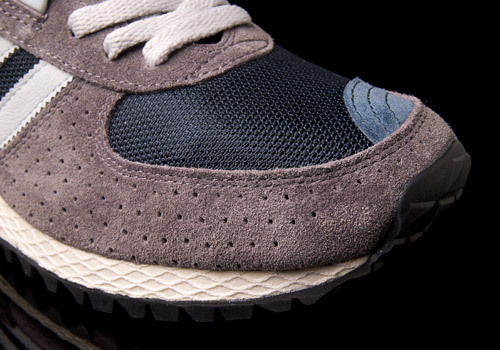 While I’ve no idea what the state of his particularly recovered pair was, it did inspire the retro release and I can say with certainty that this shoe is almost erotically comfortable. So much so that it almost makes me want to start wearing runners again (I’ve been a basketball diehard for some years now). 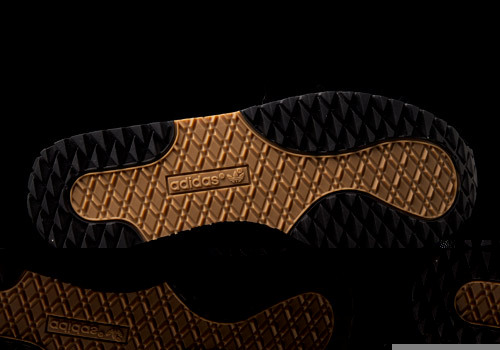 The main technological feature that the Trefoil tribe attributes to the shoe is their so-called Web concept, which they say “distributes impact shock to cushion your stride when your foot hits the ground and, in turn, then performs like a trampoline to add spring to every step you take.” And this is true, beneath the non-removable, cushioned sockliner is a slight bouncing effect that pleases the foot quite well. 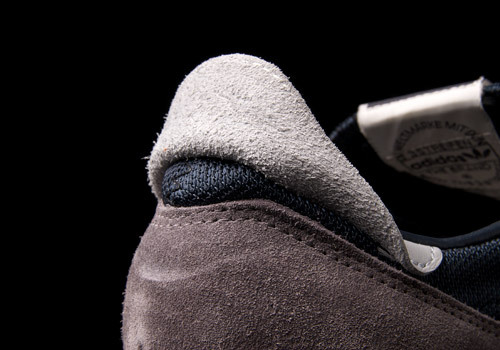 Beyond these points the inner lining is fantastic and the upper is a sweet mixture of suede, mesh, and leather. I must admit that the toe bit immediately reminded me of a Court Victory (a tennis shoe from an adidas subsidiary), but for anyone unaware of that silhouette this feature should provide a unique identifying freckle by which to better recognize the City Marathon PT in a crowd. All materials are extremely high quality and the leather heel patch is absurd: I absolutely love how it hangs way over the back like a coat tail, something I’ve literally never seen before. And while I must admit I’m no Ghilly guy at all, I do enjoy how those D-rings pop out of the suede eyestays on either side of the narrow throat. 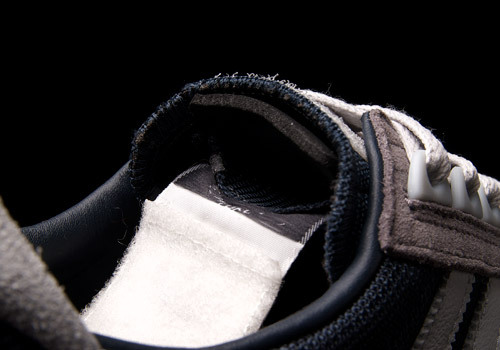 Funnily enough, this strange anatomical feature (the narrowing slit showing only part of the tongue) makes sense, as the biggest surprise with this pair is the velcro tongue patch, which, when peeled back, shows off a foam wedge that can be slid in and out of the tongue itself to adjust firmness. How freaking cool is that? 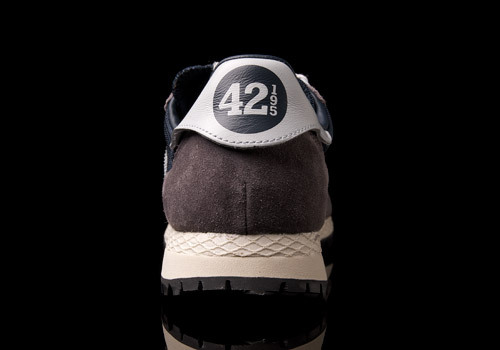 As an added bonus, the pack was coined “42/195″, in reference to the distance (42.195km) which it takes to complete a marathon course. 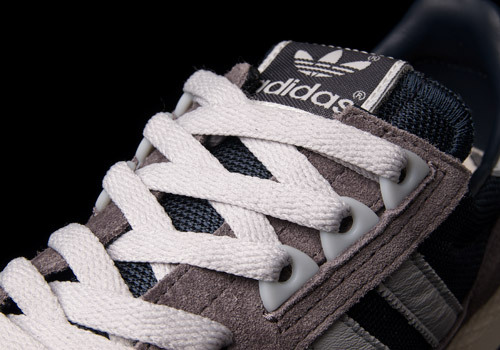 You gotta love adidas Originals for details like this; always telling a story with each pair of trainers.